The journey from QUESTNET to QNET in 16 successful years, with every glorious moment. QNET is one the first companies to be jointly Accredited by Casetrust and DSAS (Direct Selling Association of Singapore). QNET Returns as Sponsor of Tour du Faso, a major annual African Cycling circuit. Enhances its Compensation Plan into a Hybrid Plan that pays higher, promotes a strong rewards and recognition system and better supports the repeat purchase model, while still supporting the durable qualifying sales model, branded as QInfinite representing unlimited opportunity to earn. Qplus (representative office of QNET in the Philippines) is inducted into the Direct Selling Association of Philippines (DSAP). Localises its operations in Egypt and Ivory Coast, with an ambitious localisation strategy for the following years. Earns Certificate in Best Practices by International Body for the Contact Centre Industry, Contact Centre World. Becomes a finalist in the Specialist Website category of the Internet Show eCommerce Website Awards. The industry’s media crowns QNET with three esteemed awards: Obtainer Worldwide Direct Selling Best Trainer Award, Obtainer Worldwide Direct Selling Best Team Award and the Networking Times Master Networker Award. Earns esteemed Caring Company recognition by the Hong Kong Council of Social Service for the fourth year running confirming commitment to good corporate citizenship and proactive CSR initiatives. Accepted as a member of Health Supplements Industry Association of Singapore (HSIAS), and Hong Kong Health Food Association (HKHFA). QNET continues its expansion into the consumables market with new personal care and nutritional supplements being offered to retail customers and network distributors. Obtains NFS Certification for HomePure Water Purifier and its replaceable water filter cartridge, an industry accredition that ranks products among those manufactured and operating under strict guidelines and exemplary standards. Breaks all records with 10,000+ participants in the Annual Convention at Putra Stadium, Bukit Jalil, Malaysia. Looks towards Europe with a franchise launched in Turkey to meet the growing local demands of the market. 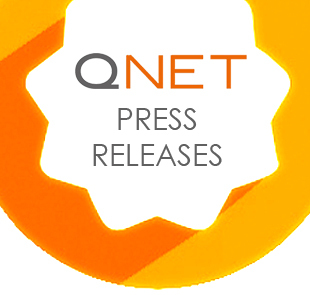 QuestNet becomes a new company QNET to reflect organic growth, an expanding product offering, localised operations, and the natural evolution of the company. Awarded Caring Company recognition by the Hong Kong Council for Social Services, for the third year in a row. Joins the Association for Persons with Special Needs (APSN) to brighten the life of 22 children during the AFC Champions League (ACL) 2010 (QNET is the official Direct Selling supporter of ACL). RYTHM Foundation takes part in providing relief to various communities in Kazakhstan, inclding donation of a bus to the Regional Special Boarding School for Hearing Impaired Children. RYTHM Foundation arranges for 50 children from Jatinegara region, East Jakarta, to attend an AFC Champions League Match. Receives coveted VeriSign Cybertrust Certification, recognising safe, secure and stable online transactions. Becomes the first and the only Direct Selling Company to sponsor a Formula 1 Team by signing historic long-term Partnership with Virgin Racing of Sir Richard Branson. Becomes premier sponsor of Hong Kong Football Club (HKFC) Rugby Team and Muharraq Basketball Club in Bahrain. Signs Muttiah Muralitharan as QNET’s Official Product Ambassador, moments after he became the highest wicket-taker in cricket’s history. Adds another Direct Selling Association membership to its global operations, with an induction into the Direct Selling Association Malaysia (DSAM) for QNET Malaysia, as testament to the company’s growing influence and standing in the global direct selling industry. Partners with World Vision International and donates USD 110,000 to sponsor 121 impoverished children in 11 countries under two-year sponsorship programme. Induction into prestigious Direct Selling Association of Singapore (DSAS), an association formed to represent the interest of legitimate direct selling companies. Sponsored Yonex-Sunrise Hong Kong Open Badminton Super Series 2009, duly endorsed by the BWF (Badminton World Federation). Partnered with Asian Football Confederation (AFC) as an official sponsor of the AFC Champions League. QNET Malaysia, is accepted as a Member of Malaysia Direct Distribution Association (MDDA) and Business Ethics Institute of Malaysia (BEIM). Ranked as one of Indonesia’s top network marketing companies by a leading business magazine. Sponsors major CASE (Consumer Association of Singapore) event. Professional golfer Thongchai Jaidee (World Top 50; Asia Top 3) becomes the official Product Ambassador for QNET’s range of energised performance pendents, Veloci-Ti. Becomes key sponsor & partner for the QI Meritus Mahara Team in first annual GP2 Asia Series 2008. Participates in WFDSA World Congress XIII in Singapore by the World Federation of Direct Selling Association. QNET Advisory Board is established consisting of experts in legal and corporate affairs, besides business and product development, for strategic decision-making. Celebrates Tenth Anniversary, a milestone in itself. Launches aspIRe Magazine, dedicated for IRs. Teams up with international institutions to further its goal of changing lives. Cooperates with Commonwealth countries to enhance global trade and investment by sponsoring Commonwealth Business Forum 2007 in Uganda. Shows support for alleviation of human suffering by donating to Bahrain Red Crescent Society (BRCS). QNET eStore undergoes major overhaul with the addition of downloadable marketing and training tools, multilingual support, enhanced Virtual Office and localisation. Acquires a Swiss watch manufacturer in Zug, Switzerland, allowing 100% in-house design and manufacture of Bernard H. Mayer luxury product line. Makes a multimillion-dollar investment in a five-star resort in Koh Samui, renovated and re-opened as Prana Resorts & Spa ~ an eco-friendly resort which is one of the world’s first and completely vegetarian resorts. Introduces nanotechnlology-based Amezcua Bio Disc as one of the most popular wellness products. Expands into the consumable product line with addition of food supllements. Becomes title sponsor for Team Meritus in the Formula V6 Series in China. Invests in a UK-based independent telecommunications provider that has delivered some of the most advanced telecommunications solutions in the United Kingdom. Number of QNET Independent Representatives around the world reaches one million. Dispatches SMS communication with IR leaders worldwide for weekly updates and news to the network. Plays an active role in relief operations througout countries affected by the Decemeber 2004 Asian Tsunami through RYTHM Foundation. Launch of the book ‘Sphere of Silence’ by Dato’ Vijay Eswaran. Appointed as a licensed distributor of the Fédération Internationale de Football Association (FIFA) commemorative coin programme for a record of 89 countries. Releases a New Compensation Plan supplemented with attractive opportunities and benefits. Introduces the luxury watch and jewellery brand Bernard H. Mayer to the network. Microsoft spotlights QNET as one of the early adopters of Internet technology as QNET deploys Microsoft Windows Server 2003, a fault-tolerant environment providing first-class security, enhanced system manageability, and high volume transaction capability. Forms a strategic alliance with the International Badminton Federation (IBF) and sponsors the 2003 QI-IBF Badminton World Championships in Birmingham, England. Presents ‘Disney on Ice – Beauty and the Beast’ in Penang, Malaysia, for an audience of 200 orphaned children. Becomes the second-largest exhibitor at the Singapore International Coin Show in Suntec, Singapore. Participates in the 2003 Kuala Lumpur International Money Fair in Kuala Lumpur, Malaysia, and is awarded as the second-largest, most interactive, and most frequently visited booth. Appointed as one of the few authorised distributors of official coins for the Athens 2004 Olympic Games reinforcing its international presence. Launches its QVI Club Holiday Packages and subsequently partners with one of the world’s leading providers of products and services in the travel and leisure industries. Enhances eStore by launching a diverse Cycle Redemption collection with 100-plus products that include luxury jewellery, timepieces and accessories. QNET representative offices are opened in Taiwan and Abu Dhabi. Business expands to countries such as Australia, United Arab Emirates, Sri Lanka, the United Kingdom, Finland, and East Europe. Secures a landmark deal for official marketing rights to the 2002 FIFA World Cup Korea Japan coin programme. Also appointed by the Food and Agriculture Organization of the United Nations (FAO) as an exclusive worldwide agent of the FAO Gold Coins Programme. The V-Convention series of events is launched, with the inaugural event held in Bali, Indonesia. Following a successful entry into the numismatics industry, QNET continues to expand internationally through backward integration. Formalises strategic alliance with B.H. Mayer’s Mint, Germany, one of the oldest, privately owned mints in Europe. An historic 5,000 network marketers are attended the V gathering at the ULTRA Stadium, Philippines. As opposed to the spawning of door-to-door direct selling, redefines business and becomes one of the first Asian companies to push network marketing online by launching official website. Merges direct sales and multilevel marketing together with a diverse range of luxury jewellery, watches, collectible coins, and medallions (numismatics) as its sales model. Flourishes throughout Southeast Asia, beginning with Singapore and Malaysia. The V (the network training arm of QNET) celebrates first anniversary at the Westin Philippine Plaza Hotel with 1,000 guests. Amidst the Asian economic crisis and dot-com rubble, a group of friends led by two charismatic personalities set up a network marketing business in Manila, Philippines, known today the world over as QNET. Founders, Vijay Eswaran and Joseph Bismark. lead a team of enthusiastic, hardworking, young and corporate-savvy entrepreneurs to set up international business in the dynamic city of Hong Kong. Procures the official rights to distribute the commemorative coins for Sydney 2000 Olympic Games, in its inaugural year of operations only. Do you have Millionaire Mindset? Whilst every effort has been made to ensure the accuracy of the information contained in all the blog and posts, the content is naturally subject to change and I cannot guarantee its frequency. I reserve the right to make changes to the information on the blog without notice. I do not give any warranty as to the ownership of the copyright of any material forming part of this blog and do not accept any liability for any direct, indirect, incidental or consequential losses arising from the infringement of any third party rights in relation to any material on this blog.